S Koutoubi, F Huffman. Coronary Heart Disease Risk Factors Among Tri-Ethnic College Students. The Internet Journal of Cardiovascular Research. 2001 Volume 1 Number 1. Objectives: The present study identified and compared Coronary Heart Disease (CHD) risk factors quantified as "CHD risk point standards" among tri-ethnic (White non-Hispanic [WNH], Hispanic [H], and Black non-Hispanic [BNH]) college students. Methods: Three ethnic groups of college students completed the Cardiovascular Risk Assessment Instruments, and had blood pressure readings recorded. Blood sample was collected and blood lipids were measured. Data were analyzed by gender and ethnicity using one-way Analysis of Variance (ANOVA). Results: On the average, college students were below-average risk of developing CHD. Males scored significantly (p >0.013) higher than females and BNHs scored significantly (p > 0.033) higher than WNHs. A significant ethnic difference ( χ = 10.74, p > 0.030) was found with 38.4% of the BNHs being in the "fair" to "very poor" categories as compared 23.3% of the Hs and 20.0% of WNHs. Conclusions: Our findings indicate strong gender and ethnic differences in CHD risk factors among college-age population. An observational review of 14 studies in Medline found that both life stress and social support have an influence on CHD, with social support being a more significant factor than life stresses. 16 In the United States, approximately 50 million or one in four adults have high blood pressure. In 1997, Blacks and Whites in the Southeastern United States had a greater prevalence of HBP and higher death rates from stroke than did those in other regions of the country. 1 When HBP exists with high blood cholesterol, diabetes, inactivity, smoking, and obesity, the risk of CHD increases several-fold. 17 Healthy People 2010 18 recognizes the need to investigate CHD risk factors because studies of CHD in young men and women are lacking. Healthy People 2010 targets for CHD were not met, and the disparities between African-Americans and Whites were not reduced. Data are needed to determine ethnic variations in the risk factors for CHD among college students. The college years are important, since many students develop eating habits that become long-term lifestyle patterns and beliefs that help explain these habits. Therefore, it is important to learn when ethnic differences for CHD risk factors are first apparent so that preventive interventions can be initiated before unhealthy lifestyles are established. The main objective of the study was to identify, determine and compare CHD risk factors, quantified as “CHD risk point standards” for a tri-ethnic (White non-Hispanic, Hispanic, and Black non-Hispanic) college population. The specific objectives of the study were to (1) Identify the prevalence of CHD risk factors and quantify “CHD risk point standards” and (2) Compare and contrast CHD risk factors and total “CHD risk point standards” by gender, ethnicity, and gender-ethnicity subgroup. Three hundred college students at Florida International University (FIU) were recruited to participate in the study. Subjects were recruited to represent six groups based on their gender and ethnicity. Two methods of subject recruitment were used: 1) Flyers with the study outline with inclusion and exclusion criteria, benefits, and investigator's phone number were distributed and posted by the investigators at FIU campuses in areas where students congregated. 2) Students in large classrooms with diverse majors and backgrounds were also approached. Subjects who met the inclusion criteria and agreed to participate in the study were asked to report to the investigator's laboratory on campus to take part in the study. Only one visit was necessary to collect all of the required data; and the entire process took approximately 60 minutes. Subjects who were interested in participating in the study signed an informed consent form, approved by the FIU Institutional Review Board (IRB), before all tests were performed. Subjects' recruitment continued until the required number of subjects was reached. According to Cohen (Statistical Power Analysis for the Behavioral Sciences, 2nd Edition, 1988, Lawrence Erlbaum Associates, Hillsdale, NJ), an Analysis of Variance (ANOVA) using an alpha = 0.05 sample size of 50 for each of the six gender/ethnic groups would detect a “medium” effect size of 0.25 for the main effects of gender, ethnicity, and the interaction effect with a power of 98% or more. Based on the assumption above, the total sample size was determined to be n=300 students. 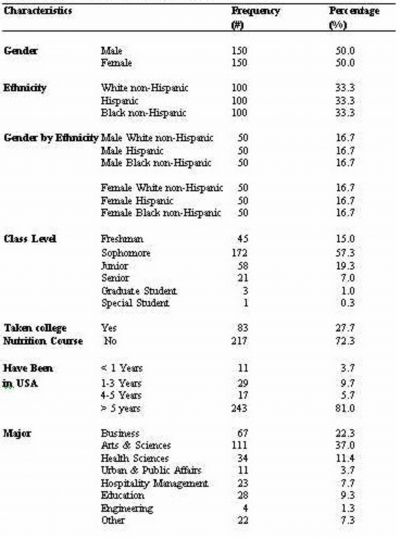 Subjects who volunteered to participate in the study and met the following criteria included College students at FIU during 1999-2000, had age less than 40 years, males and females, any major (except nutrition major), and originate from one of the targeted tri-ethnic groups, that is, Hispanic, Black non-Hispanic, and White non-Hispanic origin. All subjects were required to complete the Cardiovascular Risk Assessment Instruments (CRAIs) when they reported to the Human Nutrition Laboratory on campus. The CRAIs contained a socio-demographic questionnaire which included information regarding age, gender, weight, height, race and ethnic background, the student's class level and major, how long the student has lived in the United States, and if the student took any college nutrition classes prior to the study. The Cardiac Risk Evaluation Questionnaire (CREQ) was used to measure CHD risk factors. Measured risk factors were quantified as “CHD risk point standards,” which provided a quantitative interpretation of the risk factors of age, race, gender, diabetes, smoking, high blood pressure, high blood cholesterol, physical inactivity, obesity, and high stress level. The questionnaire also included the participant's family history of heart disease, personal history of heart disease, personal and family histories of diabetes, smoking habits, behavioral style and activity levels. A fasting blood sample was drawn from the antecubital vein, using sterile, standard techniques, with the subject in the sitting position. A 15 ml fasting blood sample was collected by venipuncture by the investigator, a trained phlebotomist. The blood sample used for the preparation of serum was collected into a vaccutainer tube. After the blood in the Serum Separator Tube (SST) had been completely coagulated, that is after a 30-minute waiting period, yet no later than 45 minutes after venipuncture, blood was centrifuged at full speed (1100 RCF) for 15 minutes. The serum was then transferred from the spun SST into three labeled plastic tubes. The first tube was used immediately for lipid analysis, the second was frozen and shipped for tHcy analysis, and the third was stored in the freezer at -70 C. for reserve. Blood pressures were measured and recorded by the investigator, who was trained in taking blood pressure. Three blood pressure readings were recorded for each subject. The first reading was taken at the beginning of the study when the subject reported to the laboratory. The second and third readings were obtained at the end of the study before the subject left the laboratory. The mean of the three readings was calculated and recorded as the blood pressure. Blood pressure was assessed using a sphygmomanometer and a stethoscope. The serum total cholesterol (TC), high-density (HDL) and low-density lipoprotein (LDL) cholesterols, and triglyceride (TG) levels were measured using the BECKMAN Synchron CX System. Blood lipid analyses were done by Quest Diagnostics Laboratory, West Palm Beach, Florida. Data from the CHD Risk Evaluation Questionnaire (CREQ) and the Food Frequency Questionnaire (FFQ) were analyzed by gender and ethnicity using the SPSS Computer Program. The results were expressed as mean ± standard deviation, or frequencies and percentages. One-way Analysis of Variance (ANOVA) was used to determine the mean differences in CHD risk point standards by gender, by ethnicity, and by gender-ethnicity subgroup with Bonferroni's pairwise mean comparison procedure. Pearson's correlations were used to associate various independent variables (IVs) to “CHD risk point standard” values. The Chi-square test was used for categorical variables with follow-up Bonferroni's Chi-square tests. 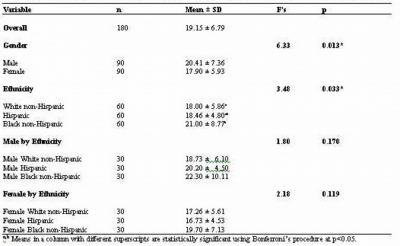 Differences were considered significant at a P-value less than 0.05. We were able to recruit 300 subjects, 50% (n=150) males and 50% (n=150) females. One-third (n=100) were White, not of Hispanic origin (WNH), Hispanic (H), and Black, not of Hispanic origin (BNH). There were 50 subjects in each of the gender-ethnicity subgroups. Only 27.7% (n=83) of the subjects have taken a college nutrition course (Table 1). Sixty percent (n=180) of subjects were between the ages of 19 to 20 years. The mean age was 20.8 ± 3.9 years (mean ± SD). More than 74% (n=224) of the subjects were 61 to 70 inches in height with a mean of 67.0 ± 4.0 inches. Fifty-two percent (n=156) weighed between 101-150 pounds (Lbs). The mean weight was 150.6 ± 30.2 Lbs. According to the Body Mass Index (BMI) classification, 7.7% (n=23) of the subjects were underweight, 66.0% (n=198) were within the normal range, 23% (n=69) were overweight, and 3.3% (n=10) were obese. 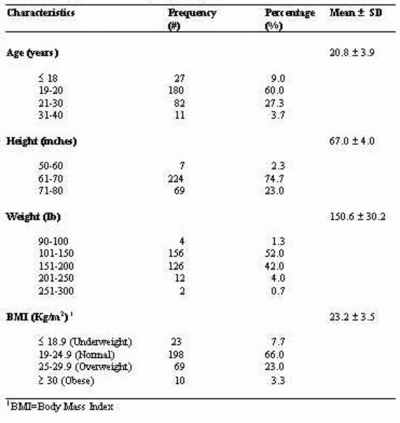 The mean BMI was 23.2 ± 3.5 Kg/m2 (Table 2). There was a significant gender difference in the distribution of the subjects (38% female, 17% male) who had taken a college nutrition class (χ2 =16.00, p<0.001). A five-category physical activity index was computed for each subject to calculate the CREQ. A significant gender difference were found with regard to the activity index (χ2 =9.55, p<0.049) with 20.0% (n=18) of males had more vigorous activity as compared with only 7.8% (n=7) of females. 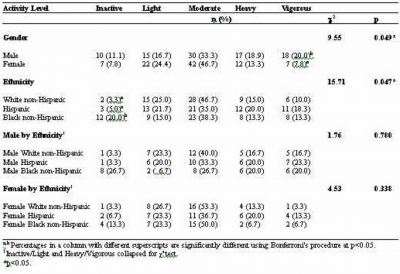 Statistically significant ethnic differences were found (χ2 =15.71, p<0.047) with 20% (n=12) of the BNHs being inactive as compared with 3.3% (n=2) of WNHs and 5.0% (n=3) of Hs (Table 3). Significant differences were found among ethnicities with regard to behavioral styles (χ2 =20.57, p<0.008). Thirty-percent (n=18) of the WNHs reported being sometimes calm as compared to only 13.3% (n=8) of the Hs and 8.3% (n=5) of the BNHs. Significant differences were found in gender-ethnic groups (χ2 =20.55, p<0.002) with 40.0% (n=12) of WNH males reported being sometimes calm as compared to none (n=0) of H males and 10.0% (n=3) of BNH males. 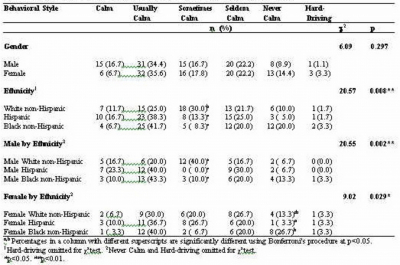 Significant differences were also found in females (χ2 =9.02, p<0.029) with 26.0% (n=8) of BNH females reported being never calm as compared with 3.3% (n=1) of H females (Table 4). No significant differences were found by gender across ethnic groups with regard to smoking, family history of heart disease, personal and family histories of diabetes, and personal history of heart disease. The “CHD risk point standards” were calculated for all subjects (n=180). 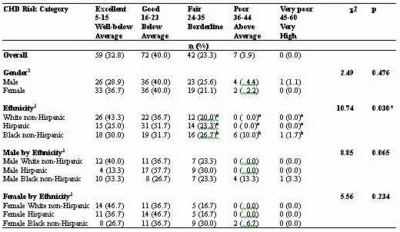 The mean and standard deviation (SD) were determined and six-risk categories were assigned by gender, by ethnicity and by gender-ethnicity subgroup. Overall, the total “CHD risk point standards” mean score for all subjects was 19.15 ± 6.79. Assigned to the CHD risk category, this indicates that on average, college students were in the “good” category, or below-average risk of developing CHD. Statistically significant gender differences were observed (p<0.013), with males scoring higher (20.41 ± 7.36) than females (17.90 ± 5.93). Therefore, males have a higher risk of developing CHD than female. Statistically significant differences were also found among ethnic groups, with BNHs scoring significantly higher (21.00 ± 8.77) than WNHs (18.00 ± 5.86), thus, BNHs have a higher risk of developing CHD (Table 5). Overall, on average 32.8% of college students fell in the “excellent” category, that is, well-below the average risk of developing CHD, and 40% fell in the “good” category, that is, below-average risk of developing CHD. A significant difference was found among ethnicities by CHD risk category (χ2 =10.74, p<0.030) with 38.4% (n=23) of the BNHs being in the “fair” to “very poor” categories as compared to 23.3% of the Hs and 20.0% of WNHs. Therefore, BNHs have borderline and above-average risk of developing CHD compared to the other two groups (Table 6). Serum lipids and lipoproteins were determined for 180 subjects. Subjects were of equal numbers by gender, ethnicity and gender-ethnicity subgroups. Statistically significant differences between males and females were observed, with males having a higher mean concentration of TG (p<0.002) 108.8 ± 71.0 mg/dl compared to 81.7 ± 40.0 mg/dl for females, higher cholesterol/HDL ratio (p<0.001) 4.0 ± 1.7 mg/dl compared to 3.3 ± 0.9 mg/dl for females, higher glucose (p<0.026) 90.5 ± 13.7 mg/dl compared to 86.9 ± 6.7 mg/dl for females, and lower HDL (p<0.001) 44.2 ± 9.5 mg/dl compared to 52.8 ± 11.0 mg/dl for females (Table 7). Statistically significant differences between males and females were observed, with males having a higher SBP (p<0.001) (118.8 ± 7.4 mmHg) and a higher DBP (p<0.002) (76.3 ± 6.8 mmHg) than females (112.7 ± 9.9 mmHg and 72.8 ± 8.0 mmHg, respectively). This study presented baseline data of a college-aged population for CHD risk factors by gendEr, by ethnicity, and by gender-ethnicity subgroup. It addresses the question whether there are ethnic differences in CHD risk factors. We hypothesized that there would be gender and ethnic differences in the activity levels, behavioral lifestyles, and smoking. The results support the hypothesis by demonstrating statistically significant differences between males and females, with males reporting more vigorous physical activity than female. More Black non-Hispanics were inactive as compared to WNHs and Hs. Epidemiological research has demonstrated protective effects of physical activity on the risk for CHD. 14, 19 Other studies support our findings that males are more likely than females to engage in regular activity and in vigorous exercise. 20, 21 Black non-Hispanics were less active than WNHs and this disparity was more pronounced for females. 20- 22 The Youth Risk Behavior Surveillance also indicated that male college students were significantly more likely than female college students to engage in vigorous exercise. 11 Furthermore, according to the 1996 Surgeon General's Report on Physical Activity and Health, the percentage of people who say they engage in no leisure activity is higher among females than males. A greater percentage of White non-Hispanics, especially, males reported being “sometimes calm” as compared to WNHs and Hs. More Black non-Hispanic females reported being “never calm” as compared to H females. Because of the relationship between CHD and a person's stress, WNHs and BNH females are at a higher risk of developing CHD. Coronary Heart Disease is a phenomenon of modern society. Acute and chronic stress may affect other CHD risk factors, such as blood pressure, cholesterol levels, smoking, and obesity. Researchers studied the role of psychosocial factors in the incidence of CHD. An observational review of 14 studies in Medline found that life stresses have a negative influence on CHD, and social support has a positive influence on CHD. 16 Our findings are consistent with new evidence, which shows dramatic increases in smoking rates among WNHs and BNHs females. 2 Cigarette smoking is the leading preventable cause of CHD in females. 23 Although the prevalence of smoking among US females declined from 34% in 1965 to 24% in 1991, smoking cessation rates have declined more slowly among females than males. 24 On the basis of current trends in 1999, it was estimated that by the year 2000, smoking rates would be higher in women (23%) than men (20%). 25 These changing demographics of smoking, especially among young females, may contribute to a higher CHD risk. The hypothesis that gender and ethnic differences in blood pressure, in personal and family histories of heart disease, and in personal history of diabetes would be noted for this population were supported; results demonstrate statistically significant differences between males and females, with males having higher systolic and diastolic blood pressure (BP), which supports our hypothesis. Epidemiological studies document a strong association between high levels of both systolic and diastolic BP and risk of CHD in both males and females. 26 The findings of our study are supported by other findings. Researchers found that blood pressure measures were higher for BNHs than for WNHs. 2 Although no significant differences were found in the family history of heart disease nor the personal and family histories of diabetes, the lack of knowledge regarding the history of heart disease and personal and family histories of diabetes was evident and common across all gender-ethnic groups. This is an alarming observation, as college students will be put at an even greater risk by not knowing the heart disease and diabetes histories of their respective families. Results demonstrate statistically significant differences between males and females with males having a higher mean concentration of TG; higher cholesterol/HDL ratio; higher glucose and lower HDL. With regard to lipoproteins, males were significantly more likely than females to be in the “High Risk” category of HDL, while females were statistically more likely than males to be in the “Desirable” category of HDL. White non-Hispanic females were statistically more likely than BNH females to be in the “Desirable” category of HDL. High-density lipoprotein levels were inversely associated with CHD risk. In addition, an increase in HDL level in association with lowering LDL level was associated with reduced incidence of CHD in the Lipid Research Clinics Coronary Primary Prevention Trial (27), and in the Helsinki Heart Study (28). A low level of HDL cholesterol is a risk factor for CHD in younger females and was a stronger predictor of CHD mortality in females than males. 29, 30 The role of TG in CHD is controversial, but observational studies suggest they may be a particularly important risk factor in women. 31 We hypothesized that there would be gender and ethnic differences in “CHD risk point standards” and CHD risk categories. The results support this hypothesis. Our findings indicate statistically significant differences between males and females, with males having a higher risk of developing CHD. Also, a statistically significant difference was found between BNHs, Hs and WNHs with BNHs being in the “fair” to “very poor” categories as compared to WNHs and Hs. In conclusion, our findings indicate strong ethnic differences in CHD risk factors among the college-age population. On average, these college students fell in the “good” category or below-average risk of developing CHD. Black non-Hispanics fell in the borderline and above-average risk of developing CHD. Males reported more vigorous physical activity while BNHs were more likely to be inactive. A greater percentage of White non-Hispanics, especially males, reported being “sometimes calm,” while more BNH females reported being “never calm.” Males had higher systolic and diastolic blood pressure on average than females. Males had a higher mean concentration of TG; higher cholesterol/HDL ratio; higher glucose and lower HDL, and BNH males had higher cholesterol; LDL; cholesterol/HDL ratio and TG than WNH and H males. This research was supported by grant 00WM07 from the American Heart Association. 1. American Heart Association. 2000 Heart and Stroke Statistical Update. Dallas, Texas: AHA, 1999. 2. Cardiovascular Disease Statistics. Heart and Stroke Statistical Update. American Heart Association. 1997 ICD/9; 930-459: 745-747. 3. Caspersen CJ, Merritt RK. Trends in physical activity pattern among older adults: The behavioral Risk Factor Surveillance System, 1986-1990. Med Sci Sport Exerc 1992; 24:S26. 4. DiPietro L, Caspersen CJ. National estimates of physical activity among White and Black Americans. Med Sci Sport Exerc 1991; 23:S105. 5. Enos WF, Holmes RH, Beyer J. Coronary disease among United States soldiers killed in action in Korea: Preliminary report. JAMA 1953; 152:1090-1093. 6. Francis CK, Oberman A, Saunders E. Who's at risk and why. (Cardiovascular disease). Racial and ethnic differences in CVD. Patient Care 1994; 28:28-39. 7. Gordon DJ, Knoke J, Probstfield JL, et al. High-density lipoprotein cholesterol and coronary heart disease in hypercholesterolemic men: The Lipid Research Clinics Coronary Primary Prevention Trial. Circulation 1986; 74:1217-1225. 8. Greenwood DC, Muir KR, Packham CJ, et al. Life stress and social support has influence on coronary heart disease. J P Health Med 1996; 52:221-231. 9. Healthy People 2010. Available at: http//www.health.gov/healthypeople/pdf/volume2/19Nutrition.pdf. Accessed August 01/2000. 10. Kannel WB. Blood pressure as a cardiovascular risk factor. JAMA 1996; 275:1571-1576. 11. LaRosa JC. Triglycerides and coronary risk in women and elderly. Arch Int Med 1997; 157:961-968. 12. LaRosa JC, Hunninghake D, Bush D, et al. The cholesterol facts: A summary of the evidence relating dietary fats, serum cholesterol, and coronary heart disease. Circulation 1990; 81:1721-1733. 13. Leon AS, Connett J, Jacobs DR Jr, et al. Leisure-time physical activity levels and risk of coronary heart disease and death: The Multiple Risk Factors Intervention trial. JAMA 1987; 258:2388-2395. 14. Manninen V. Lipid alterations and decline in the incidence of coronary heart disease in the Helsinki heart study. JAMA 1988; 260:641-651. 15. Manolio TA, Pearson TA, Wenger NK, et al. Cholesterol and heart disease in older persons and women: Review of an NHLBI workshop. Ann Epidemiol 1992; 2:161-176. 16. Manson JE, Colditz GA, Stampfer MJ, et al. A prospective study of obesity and risk of coronary heart disease in women. N Eng J Med 1990; 322:882-889. 17. McNamara JJ, Molot MA, Stremple JF, et al. Coronary artery disease in combat casualties in Vietnam. JAMA 1971; 216:1185-1187. 18. National Cholesterol Education Program. Report of the Expert Panel on Blood Cholesterol Levels in Children and Adolescents. US Dept of Health and Human Services, Public Health Service, National Health, Lung, and Blood Institute, National Institute of Health. 1993, Bethesda, MD: NIH 91-732. 19. Newman WP III, Freedman DS, Voors AW. 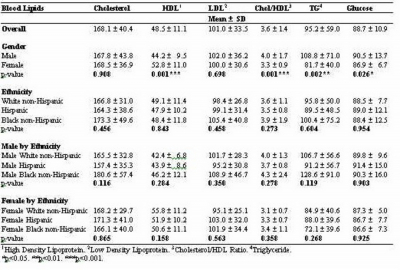 Relation of serum lipoprotein levels and systolic blood pressure to early atherosclerosis: The Bogalusa Heart Study. N Eng J Med 1986; 314:138-144. 20. Oster G, Thompson D. Estimated effects of reducing dietary saturated fat intake on the incidence and cost of coronary heart disease in the United States. J Am Diet Assoc 1996; 96:127-131. 21. Paffenbarger RS, Hyde R, Wing A. The association of changes in physical activity level and other lifestyle characteristics with mortality among men. N Eng J Med 1993; 328:538-545. 22. Pierce JP, Fiore MC, Novotny TE, et al. Trends in cigarette smoking in the United States: Projections to the year 2000. JAMA 1998; 261:61-65. 23. Sempos CT, Cleeman JI, Carroll MD, et al. Prevalence of high blood cholesterol among US adults: An update based on guidelines from the Second Report of the National Cholesterol Education Program Adult Treatment Panel. JAMA 1993; 269:3009-3014. 24. Stephens T. Secular trends in adult physical activity. Res Q Exerc Sport 1987; 58:94-105. 25. Strong JP. Coronary atherosclerosis in soldiers: A clue to the natural history of atherosclerosis in the young. JAMA 1986; 256:2863-2866. 26. Surveillance for selected tobacco-use behaviors-United States, 1990-1994. Morb Mortal Week Rep;194:43:1-43. 27. Whelton PK, He J, Apple LJ. Treatment and prevention of hypertension. In: Manson JE, Ridker PM, Gaziano JM, Hennekens CH, (ed). Prevention of Myocardial Infarction. New York, NY: Oxford University Press, 1996:pp 154-171. 28. Willett WC, Green A, Stampfer MJ, et al. Relative and absolute excess risks of coronary heart disease among women who smoke cigarette. N Eng J Med 1987; 317:1303-1309. 29. Winkleby MA, Robinson TN, Sundquist J, et al. Ethnic variation in cardiovascular disease risk factors among children and young adults. Findings from the Third National Health and Nutrition Examination Survey, 1988-1994. AMA 1999; 281:1006-1013. 30. Wissler RW. Relationship of atherosclerosis in young men to serum lipoprotein cholesterol concentrations and smoking: A preliminary report from the Pathobiological Determinants of Atherosclerosis in Youth (PDAY) Research Group. JAMA 1990; 264:3018-3024. 31. Youth Risk Behavior Surveillance. National College Health Risk Behavior Survey-United States, 1995. U.S. Department of Health and Human Services. Center for Disease Control and Prevention (CDC). Morb Mortal Week Rep 1997; 46:19-23. Fatma G. Huffman, PhD, R.D.